There are many typical products which you can buy in Myanmar, starting with puppets, umbrellas, paintings, amber, bronze and wood products, fabrics, lacquers, and silver jewellery, as well as jade. On the other hand, religious images, fossils, opium pipes, old coins, or historical documents, are forbidden to be removed from the country, except with express authorisation. Bearing this in mind, let's see what to buy in Myanmar and what the most typical souvenirs of the country. The country is one of the most important producers of sapphires and rubies worldwide, hence it is the perfect place to find them at a good price and high quality. Of course, be careful to shop only in licenced stores, where they give you the corresponding certificate of authenticity. In addition to sapphires and rubies, jade is another of the precious stones to buy in Myanmar. Its use in jewellery is widespread and, together with China, it leads the world market. Jade, besides being very appreciated in jewellery, also has a special cultural significance. Another of the typical products of Myanmar are fabrics; linen, cotton and silk are the main products which are used to elaborate dresses, handkerchiefs, and high-quality accessories. The manufacturing process is totally handmade, from its collection, to its spinning and manufacturing. The price you will pay for the Burmese fabrics is laughable if you compare it with its great quality. 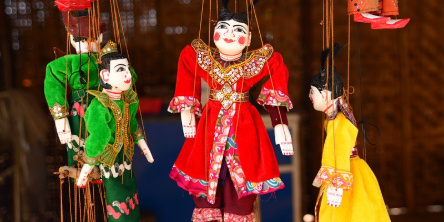 One of the souvenirs of Myanmar which most tourists buy are puppets. They are really pretty, and represent both animals as well as humans, and they are made entirely by hand. To make them use brightly coloured wood and fabrics, and if you want to get a good price, don’t forget to haggle. Who has not travelled to an Asian country and brought back a small Buddha statue in bronze, stone or wood? Well, one of the typical products to buy in Myanmar are without a doubt the bronze sculptures. In the Inle Lake, there are the best goldsmiths of the country, and this is where you can find the most beautiful works at the best price. Of all the typical products of Myanmar which tourists take home, tapestries occupy one of the top positions. They are made with different pieces of cloth, which are joined together by sewing them with gold and silver thread. The result is a beautiful set of delicate colours that represent mostly mythological or religious scenes. As for the paintings, you can buy both acrylics and watercolours from local Burmese painters. If you want a special gift, you can buy some of the watercolours made by Buddhist monks, whose price is symbolic, and whose beauty will captivate you.